This is the easiest almond cake with just 4 main ingredients. This cake has a soft, moist crumb and is lightly sweet with a pop of lemon flavor. You won’t believe it is a grain free and gluten free cake recipe! 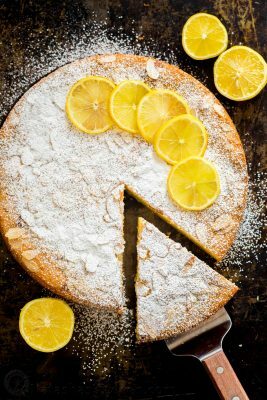 This almond cake comes together quickly and is perfect for unexpected company or satisfying the evening sweet tooth. My mother particularly loved this recipe and no matter how old you are, when your Mom is impressed, it’s a big deal :). We added our Amazon affiliate links for the tools we used to make this recipe. One of my readers, Yana P. wrote in and shared this Calabrian Walnut Cake with us and since there is a Walnut allergy in the family, we made it (even simpler) into an almond flour cake and changed the proportions. I made it 3 times in 1 week and it disappeared fast every single time. Its a keeper! 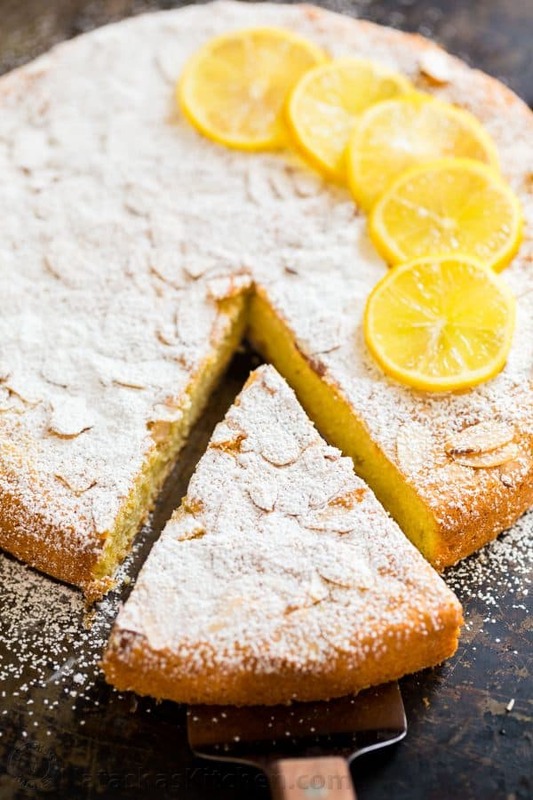 The texture of this almond cake is so soft and fluffy, you would never guess it is made with finely ground almonds.You can also make a double batch and create a stunning two-layer cake since it bakes up level and is sturdy enough to stack. This would make an amazing gluten free birthday cake!! Spoon almond flour into a dry ingredients measuring cup and level off the top with the flat edge of a knife. Do not compress the almond meal into the cup or you may end up with up to 50% more flour! 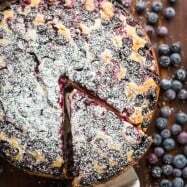 Read all of our tips and tricks for how to measure accurately for baking. To separate eggs, you can either use an egg separator or the shells of your egg if you get a clean break on the shell. It is easier to separate eggs while they are cold. To do that, separate eggs then cover and leave at room temperature no more than 30-60 minutes. 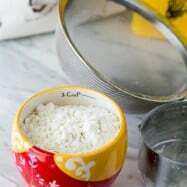 You could also separate them and place into separate small bowls and set the egg whites over a larger bowl with warm water so the bowl with the egg white warms up within 5-10 minutes. 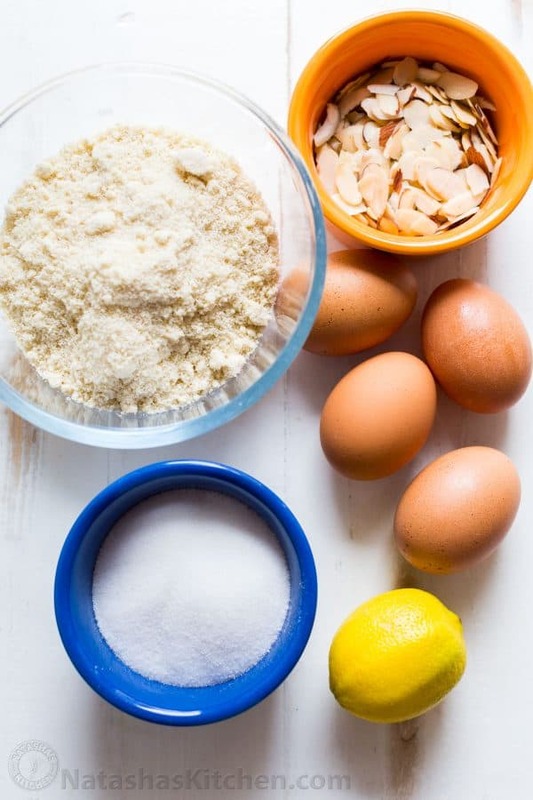 This is the easiest almond cake with just 4 main ingredients. This cake has a soft, moist crumb and is lightly sweet with a pop of lemon flavor. You won't believe it is a grain free and gluten free cake recipe! Grease/butter a 9" cake pan or 9" springform pan. Line the bottom with a circle of parchment paper. Preheat oven to 350˚F. In a large mixing bowl, combine 4 egg yolks and 1/2 cup sugar. Beat with an electric hand mixer on high speed 3 minutes or until thick, creamy and lightened in color. Add 1 1/2 cups almond flour and 1 Tbsp lemon zest and use a spatula to fold and stir together until incorporated. Wash and dry attachments from the mixer. In a second large mixing bowl, add 4 egg whites and beat together until stiff peaks form (about 2 minutes). Fold the egg whites 1 heaping spoonful at a time into the almond batter, folding with each addition just until incorporated and scraping from the bottom of the bowl to ensure batter has an even consistency. Once all the egg whites are incorporated and batter is even in consistency (do not over-mix), transfer batter to the prepared baking pan and sprinkle the top with 1/4 cup sliced almonds. Bake at 350˚F for 30 minutes or until top is firm. 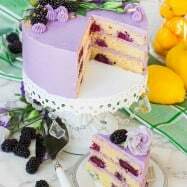 Let cake rest in the pan 15 minutes then run a thin spatula around the sides and invert it onto your hand then place it right side up on the rack. 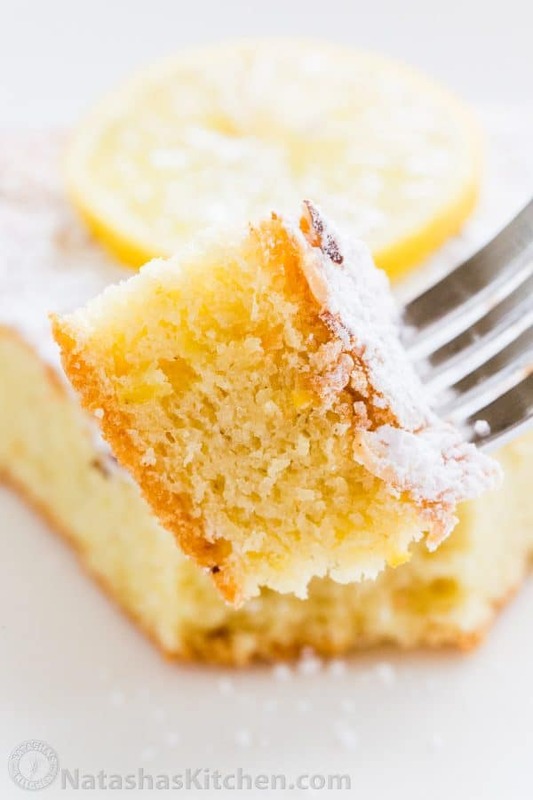 Let cool to room temperature and garnish with powdered sugar and lemon slices if desired. Q: What are your very favorite almond flour recipes or gluten free recipes? I’d love to hear from you in a comment below! We are always looking for new ideas. tried your almond cake recipe today.. and substituted the sugar for stevia… taste GREAT !.. thank you. I tried the recipe with 3 eggs and added 1/2 tsp baking powder as i felt egg smell will be more on cake. also i added vanilla extract..
Oh-M-Geee! 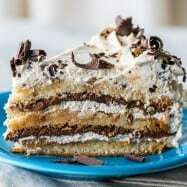 I just made this cake and it’s sooo good! I didn’t have any lemons on hand so I used lemon extract. this is my family’s favourite at the moment. I substituted the sugar with honey. Still delicious. Hi Natasha! I want my cake to be a little taller- can I use a 7 inch pan? Will it make the top too crispy since I have to bake longer? Also, do you have any recommendations for toppings/glazes/creams? I was wondering how to correctly measure the Almond Flour into the measuring cups noted on your Ingredient list…?? Just wondering how to store this after baking (making a day or two in advance for mum’s birthday). Hi Gina, I haven’t experimented with anything besides sugar. It is on my list to try this with honey but without testing it first, I can’t make a specific recommendation. Whenever I visit your website, I find something new and amazing work. Your work is amazing. I loved it. I will enjoy this Almond Cake–but would really appreciate the Walnut Cake as well! Great tips and suggestions, thanks for sharing with other readers! Some readers have reported using coconut flour. If you experiment please let us know how you like it! Thanks Leena! I made this recipe for me because I love baking with almond flour.My husband ate it all up! We loved the flavor and the texture was perfect. I am so glad you are adding some gluten-free recipes! I can’t wait to try the almond cake as I have a ton of almond flour and rarely use it. Have you tried other gluten-free flours? I love Grandpa’s Kitchen Gluten-Free flour blend and find I can make almost anything I want to and it tastes great, which is unusual for gluten free. I’m curious about your experience with gluten free flours and what you use. My favorite recipe is the Angel Food cake I make with the Grandpa’s Kitchen flour, my husband couldn’t believe it was gluten free. Preheat oven to 350˚F. Move oven rack to lowest position (remove other racks). In medium bowl stir together flour blend and 3/4 c of the sugar. Set aside. In large mixing bowl, beat egg whites, cream of tartar and salt on medium speed with wire whip attachment until foamy. Increase speed to high and beat until egg whites have doubled in volume and thickened. About 2 minutes. Beat in remaining 3/4 c sugar a little at a time on high speed, add vanilla with last addition of sugar, until stiff and glossy meringue forms. Do not under beat. Sprinkle sugar/flour mixture, 1/4 cup at a time, over meringue, folding in just until mixture disappears, transfer egg white mixture to a very large bowl if necessary. Spoon into ungreased 10 inch angel food (tube) cake pan. Gently tap pan on counter to remove large air bubbles. Bake 40 to 45 minutes or until cracks feel dry and top springs back when lightly touched. Do not under bake. Immediately turn pan upside down onto heatproof bottle or funnel until cake is completely cool, about 2 hours. Run knife or long metal spatula around edge of pan to loosen. Turn cake out onto serving platter. Use long, serrated knife to cut cake. Thank you. 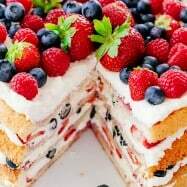 I tried sending you a picture of the Angel Food cake but I couldn’t figure out how to upload it, it’s so pretty. You see it on the Grandpa’s Kitchen website along with a bunch of other recipes. They don’t have nearly as many as you, but they have some good ones. You’re so welcome, Penny! I’m happy you enjoyed that!! Can you give the correct weight of the almond flour? I’d feel better that I was measuring correctly (haha — I don’t trust myself). Hi Shannon, I haven’t experimented with anything besides sugar. It is on my list to try this with honey but without testing it first, I can’t make a specific recommendation. Thank you for your quick response. 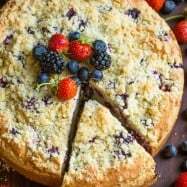 I have used coconut flour in the past and could use it in this recipe as suggested. However, my question is about substituting refined white sugar with coconut sugar and using a lesser amount. I do this with most recipes and wondered if it would work with this one. Hi Barbara, Well that was a honest mistake… I totally read flour out of habit. I haven’t tested coconut sugar myself. So without knowing the exact sweetness level or how it reacts to baking I won’t be able to say specifically. So many of your recipes have lemon zest. I don’t like citrusy smells and tastes. Is there anything else to substitute?